Grooms no longer take second place when it comes to fashion as earlier the focus seemed to be all about the bride and her look at weddings. Today’s stylish grooms demand the best and the latest when it comes to ensembles, styling, and accessories. 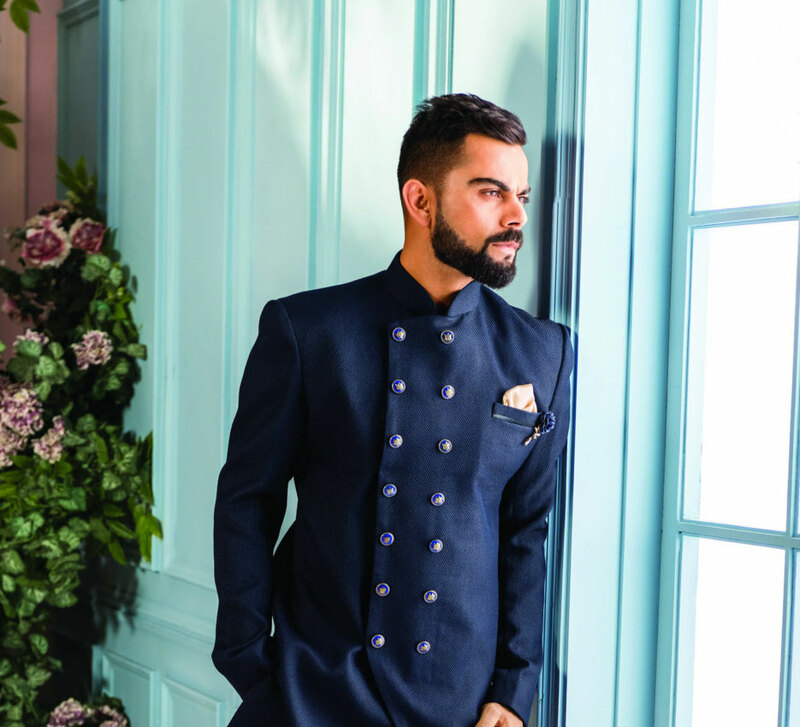 That’s why many brands are catering to this segment with contemporary designs and sharp tailoring that is geared to make a groom and his squad stand out on the big day. 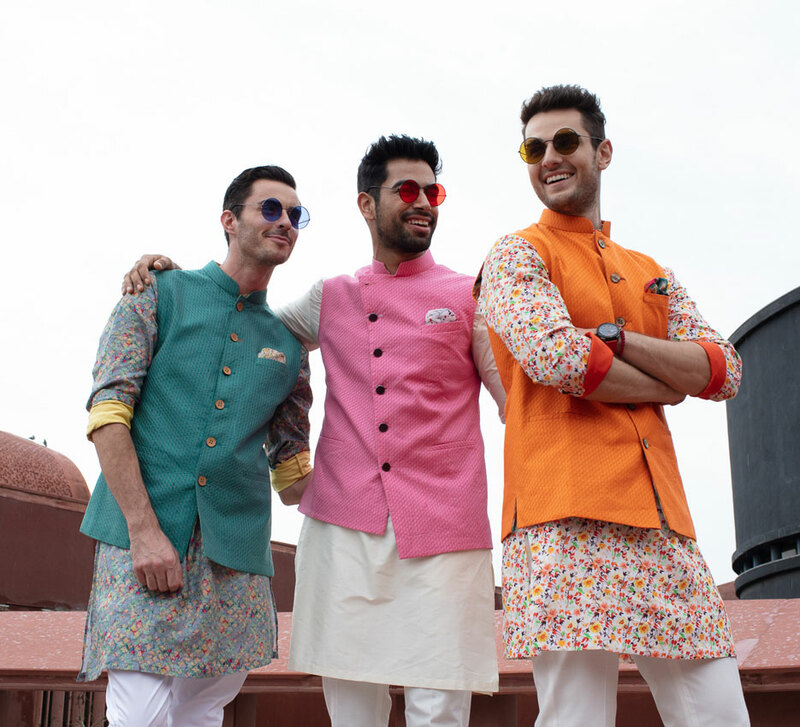 JadeBlue, one of India’s leading festive clothing brands for men, has tapped into the sartorial needs of men and come up with unique designs that blend classic and contemporary aesthetics. Their wide range of collections has different ensembles for different moods and occasions. Their diverse creations in the same color family allow groomsmen to coordinate their looks while choosing a silhouette that appeals uniquely to them. Want to show everyone that you are a pack that runs together? Do it by opting for JadeBlue outfits in different hues from the same color family. The asymmetric cut bottle green Jodhpuri jacket complete with rectangular metallic studs is great for a traditional wedding where a groomsman wants all eyes on him. Brothers of the groom should check out the olive green achkan. With its rich color, statement buttons and embellishments on the pocket, this suit is all about sleek styling accentuating traditional elements. For the groom, we recommend an outfit in a neutral color that features touches of colors on his groomsmen's outfits. This cream sherwani covered in hand-embroidered French knots and worn over a green kurta and dupatta will have him looking like royalty on his big day. For the groomsman who is all about interesting details, this green achkan will do the trick. 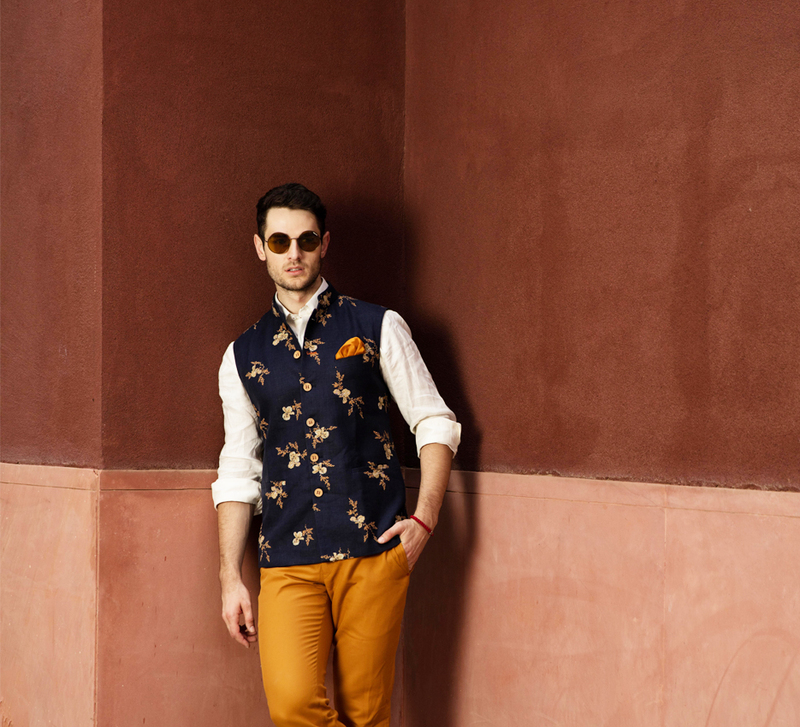 With peacock feather motifs printed all over, this outfit unites ethnic motifs with a youthful vibe thus making for an eye-catching attire. Nothing looks better than a pleasing muted color palette on a bright afternoon, and JadeBlue has something for everyone in the groom’s team. Minimalism has its charm. This cream achkan made using textured fabric and embellished with a golden double pin brooch is sure to make a groomsman stand out with its understated elegance. The groom who finds himself drawn to classy couture will appreciate this beige sherwani that incorporates tone-on-tone work with soft pink accents. Teamed with a 'kamar bandh' (waist band) that carries the same design theme and a printed stole, this outfit is an exquisite head turner. A light pink Jodhpuri jacket like this one spells sophistication and class. Accessorized with a golden brooch, this outfit paired with white pants is all about projecting a man’s softer side with confidence alongside a sharp silhouette. The beauty of nature exudes timeless charm and JadeBlue’s floral-inspired looks for men are refreshing showstoppers in the festive wear sphere. A creative spin on lush greens, this achkan that is ideal for the groom’s brother incorporates pigments from blades of grass. The gold buttons with an antiquated flourish match the charming details on the collar. The cream canvas of the groom’s sherwani contrasts beautifully with the floral motifs on it in colors of bright red and warm gold. The red ‘safa’ (turban) and beige stole blend well together despite the diverse motifs and offers many visually arresting points. The Mughals broke new grounds when it came to painting ornamental floral patterns. An ode to their classic art, this Jodhpuri jacket for the groom’s best friend gives their skill and style a modern context. Motifs play a big role in Indian fabrics and designs. JadeBlue’s collections incorporate beautiful motifs in interesting ways to make a festive ensemble stand out. Simplicity lies at the core of this white kurta that is paired with a long green koti (jacket). 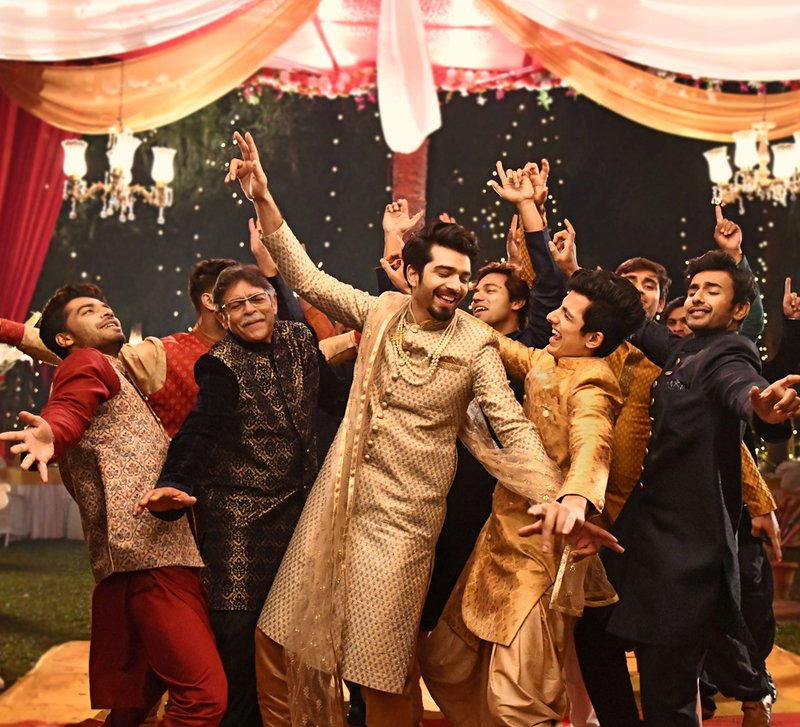 With little tone-on-tone motifs and a light sprinkle of golden sequins, this one is crafted keeping in mind the groom’s brother. For the groom, we recommend this white sherwani that is imprinted with four different kinds of motifs in a way that elevates the symmetrical beauty of this piece. The peach dupatta makes for a seamless match and elevates the beauty of this ensemble. If subtle coordination is what your group prefers, opt for ensembles with discreet matching details such as embroidered collars or asymmetric hems like the ones shown above. A muted pale blue achkan with an asymmetrical hem and a row of off-center buttons creates interest with its unpredictable lines. This contemporary style with a traditional dhoti and pastel blue stole is just what the groom’s favorite cousin needs to shine in the crowd! For the groom, this off-white sherwani covered in intricate designs created with soft pink and green threads offers just the right blend of traditional and trendy elements. Paired with a pink stole and a matching ‘safa’ (turban), this ensemble headlines princely elegance from top to toe. Layering adds dimension to an outfit and makes it more visually appealing. This cream achkan worn over an earthy brown kurta and darker brown trousers creates depth and contrast in a compelling manner. The design on the collar, buttons and fabric textures all come together to present a sharp, coordinated look.